Back Issue Ben: Guarding the Galaxy, Part 6: Annihilation! Previously, we’ve explored the key characters and miniseries that led in to the cosmic epic Annihilation. First up, we met a changed Thanos that appeared to have a different agenda. Next, I covered the reintroduction and retooling of characters like Drax, Gamora, Ronan, Nova, and the Silver Surfer, while also being introduced to new characters like Cammi and Praxagora. All of this happening within the backdrop of a galactic invasion from the Negative Zone, led by a newly formidable Annihilus. 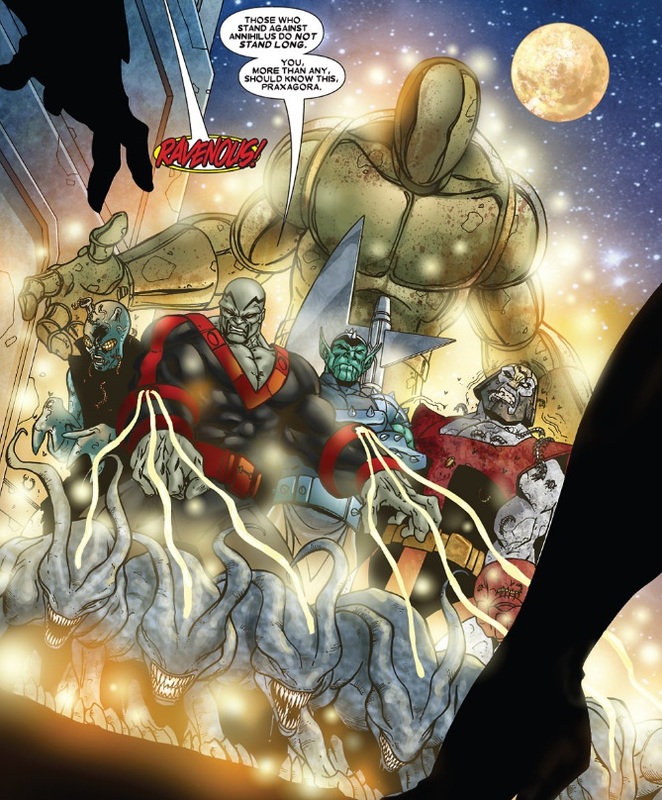 The majority of the Nova Corps, Quasar, and the Super Skrull have already perished in the conflicts. The planet Xandar, the Kyln, and all of the Skrull worlds have been demolished. War reigns over the galaxy. All the buildup is over, the pieces are in place, the moment has arrived. 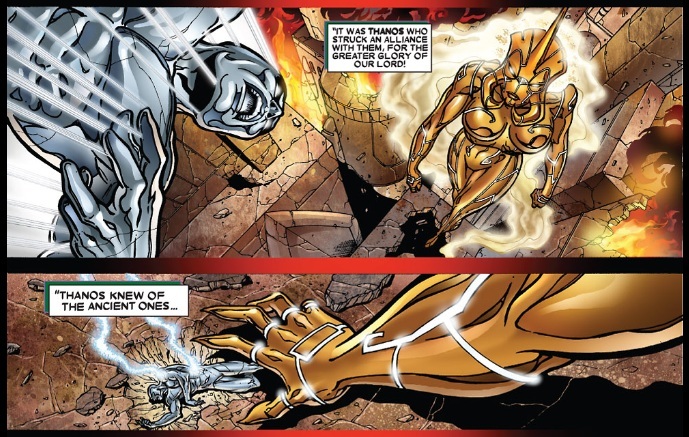 Nova commands a resistance force attempting to hold back the advancing Annihilation Wave, on the edge of Kree territory. The former Starlord, Peter Quill, has joined him as his second-in-command. Gamora is out running black ops missions for them. Their right flank has been breached. 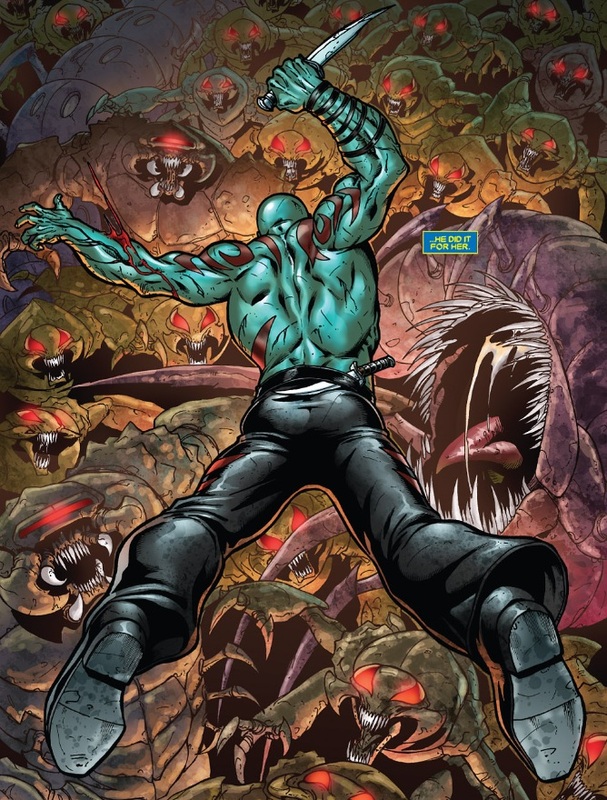 Since the House of Fiyero seized control of Hala, the Kree soldiers have been ever decreasing in effectiveness. Thankfully, Ronan was on the scene to take control, and push the invaders back. 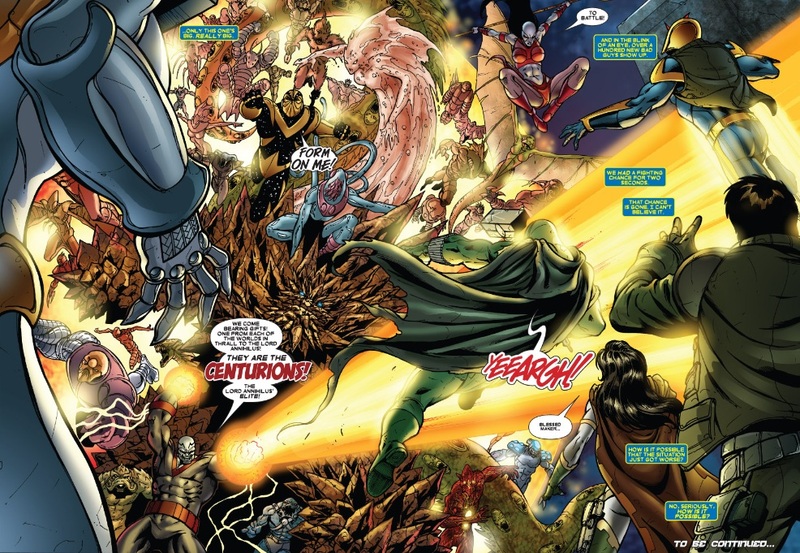 With the invasion force having destroyed their first forcefield generator, Nova calls for a retreat back to the second line, while in orbit above the battle, Firelord, Stardust, and Red Shift keep the invasion force from attacking Nova’s forces from above. Nova sends Peter and the rest of his command unit ahead, while he turns back to take on the bugs himself. 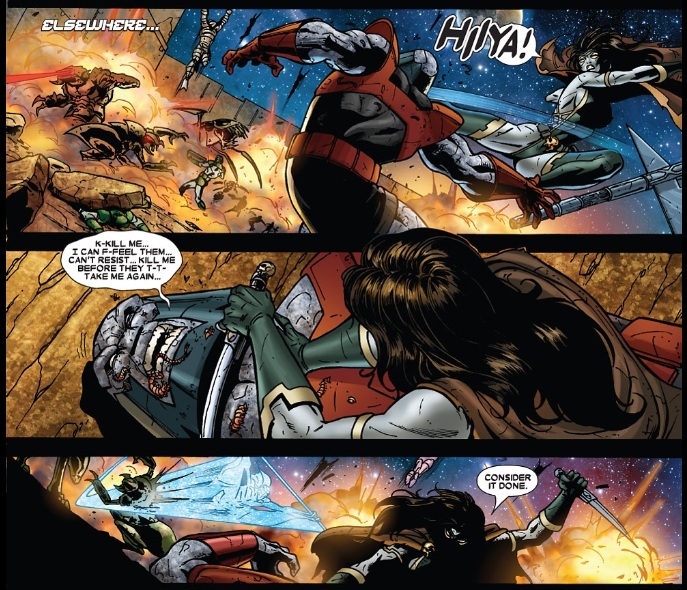 While Drax does some destroying, he has Cammi carried away to safety by a Kree warrior. 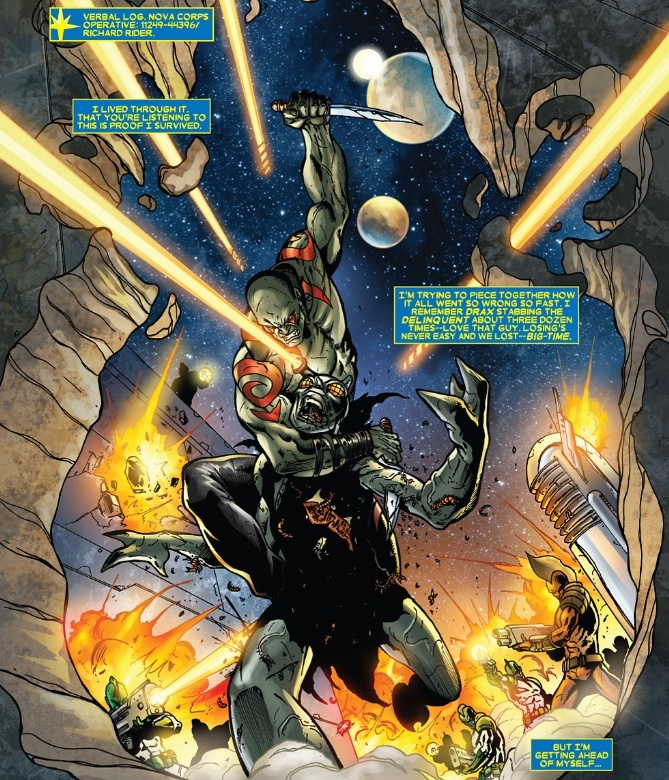 Drax has played mentor to Nova since the Annihilation Wave began, turning him into the warrior he is today. When it looks like Drax might be overwhelmed, Nova comes in for the save. Nova grabs Drax and flies off to join their retreating army. With the invasion force catching up to their retreating wounded, Nova makes the hard decision, at Drax’s prompting, to order a full-scope ordnance barrage on his position. This eradicates the bugs, along with a portion of his retreating forces. Meanwhile, up in orbit, Firelord expended most of his power attacking the flagship of the invasion fleet. 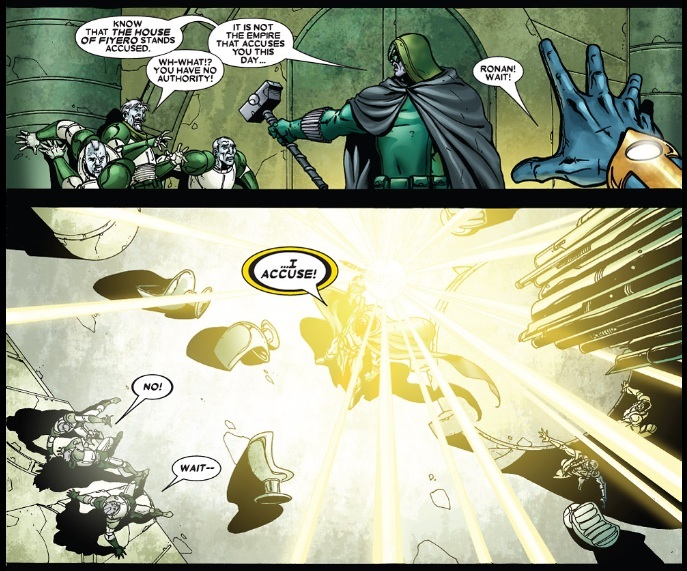 Fortunately, his efforts confirmed what the resistance force had already suspected, that Annihilus’ queens were part of a hive-mind command structure. Once Firelord cut this queen, Extirpia, off from the wave, the rest of their attack fell into disarray. 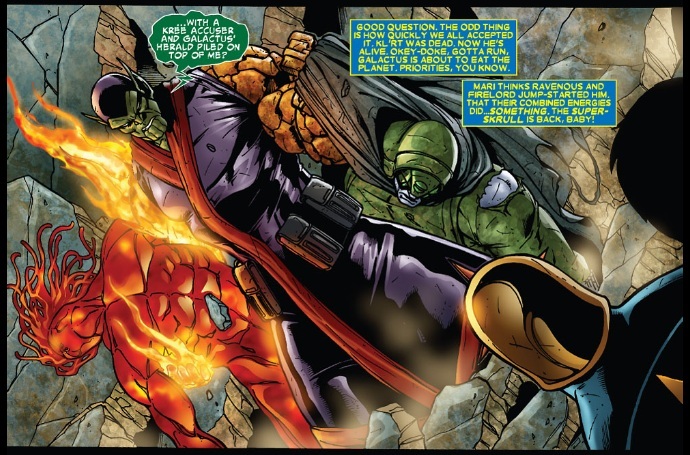 Later, aboard his flagship, Annihilus berates Thanos over his perceived failure to capture the heralds. Thanos boasts of a greater success, using the battle with Nova’s army as a distraction. Cutting off the transmission, Annihilus turns to Ravenous, who swears to terminate the heralds. 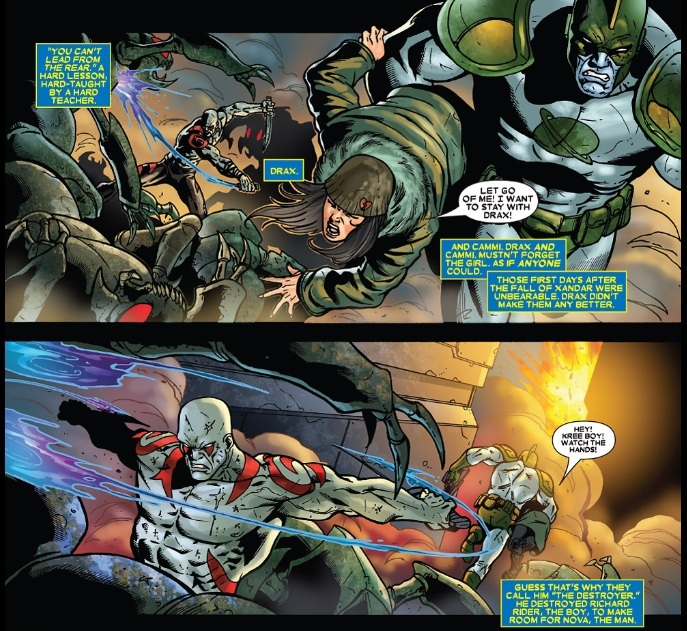 Nova recovers from the battle, with new romantic partner Gamora as his company. Richard leaves her to consult with Peter Quill about the status of the resistance. Drax rests and recuperates while Cammi eggs him on. She knows the only reason he is fighting this war is to get to Thanos. Nova and Peter look in on the fallen Firelord, their medical personnel unable to determine if he’ll recover, or how to treat him at all. Next, they stop in on their secret prisoner, the queen Extirpia. She taunts them about giving up, that the war has already been won. While their battle raged, Thanos, with the help of cosmic powerhouses Aegis and Tenebrous, attacked the Silver Surfer and Galactus. Aegis defeated the Surfer, and then turned to help Tenebrous against Galactus. When the battle was over, Galactus had fallen. 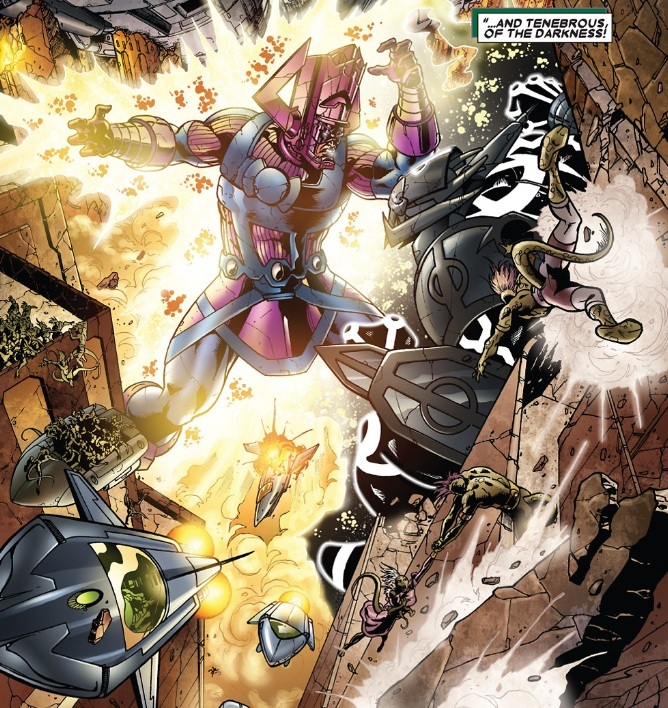 Galactus and the Surfer are captured by Thanos and his ancient cosmic beings, all under the command of Annihilus. “This war is ended!” she declares again. Drax and Cammi banter, and argue over whether or not to eat roasted bug. 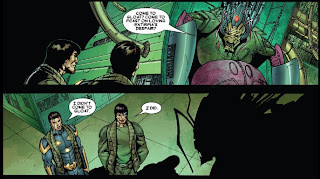 A weak and wounded Phyla arrives, informing Drax that his daughter (Moondragon) has been taken. Moondragon had accompanied Phyla to Titan, where she visited the graves of her father and brother to pay her respects (Phyla is the daughter and sister of the previous Captains Marvel, Mar-Vell and Genis-Vell). Thanos arrived, easily subduing the both of them. 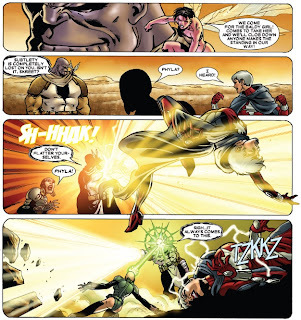 Tearing off Moondragon’s left ear and tossing it to Phyla, Thanos told her to give Drax the message that he has his daughter. 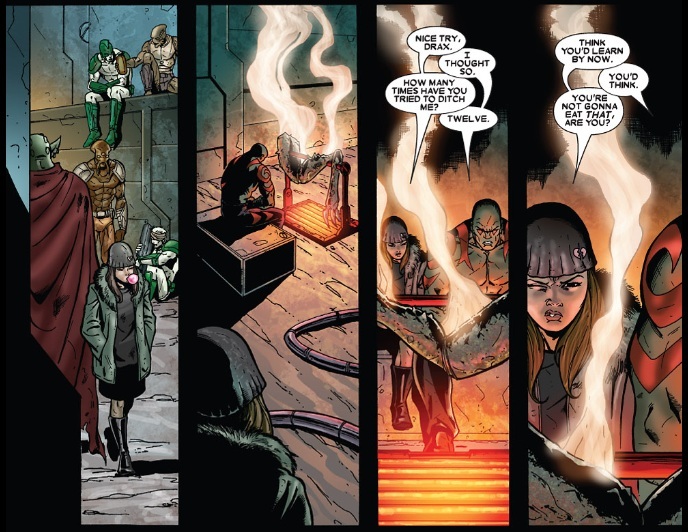 Phyla tries to convince Drax to stay away, for Heather’s safety, let her try to rescue her. Drax refuses. Thanos’ destruction is his destiny. Nova, Starlord, and Ronan meet with the House of Fiyero, where Ronan pleads with the Kree ruling body to send them suitable Kree warriors, instead of the merchants and cast-offs they have been getting. The ruling body refuse to work with Ronan, and when Nova backs him up, they turn their weapons upon the heroes. Ronan takes matters into his own hands, and deals with the situation most definitively. 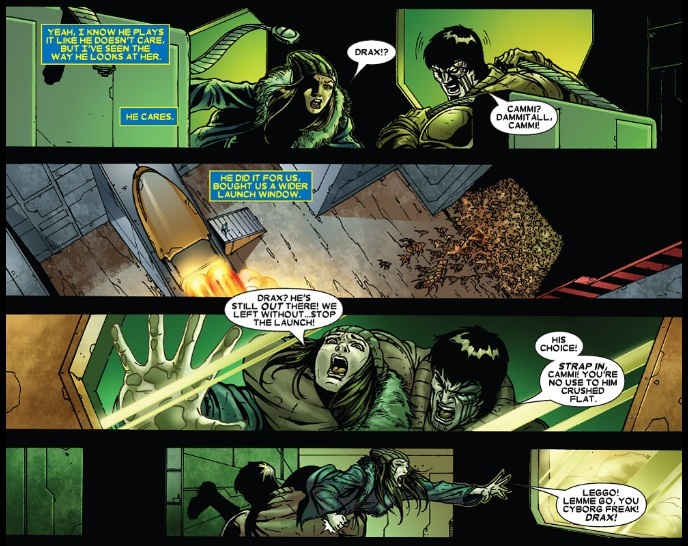 As they argue over his rash actions, Gamora interrupts to inform them of the arrival of Praxagora, who has traveled all this way with the dead body of Kl’rt, the Super-Skrull. 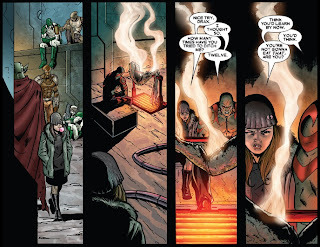 She recounts the story of how she set herself up to detonate, to take out an Annihilation super weapon, but Kl’rt used his powers to absorb all the intense heat she was generating, sacrificing himself to save her, and died a hero. 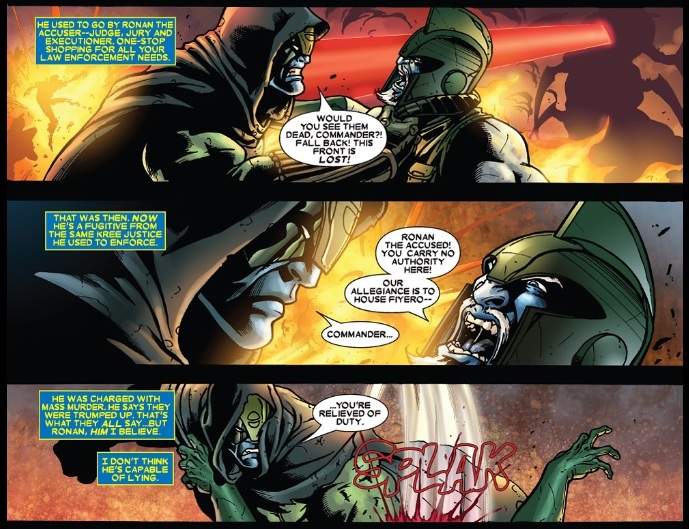 Ronan, a Kree and sworn enemy of the Skrulls, is not impressed. As Peter and Gamora question Praxagora’s true alligience, as she is a life form from the Negative Zone, Ravenous arrives out of nowhere, using Thanos’ teleportation tech, accompanied by Paibok, a zombie-fied Terrax, and a Mad Thinker robot, among others. 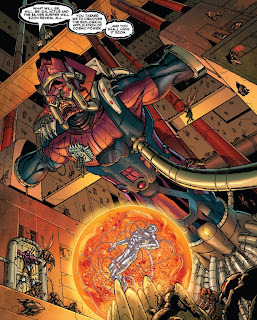 On his starship, Thanos reveals the captured Galactus and Silver Surfer to Annihilus. Back at the camp of the United Front, the battle begins. The heralds arrive from space as reinforcements. 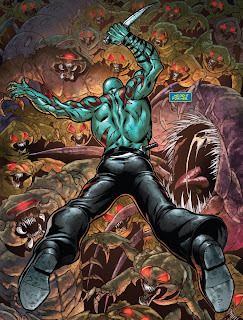 Terrax is under some form of mind control, and is not at full capability, while Ravenous and Ronan face off. Suddenly, there is another energy surge, and then a hundred more enemy warriors teleport into the fray. They are the Centurions, and they represent a warrior from every single world in thrall to Annihilus. My brain thoughts: Giffen just keeps piling more and more onto our heroes. 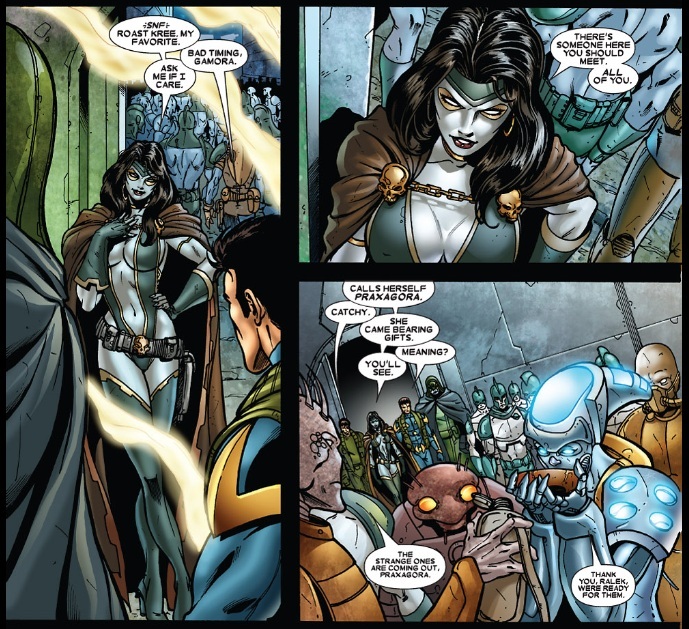 Praxagora makes her entrance into the bigger storyline, along with Phyla and Moondragon. Phyla will be an important character in the Marvel cosmic universe. Drax and Cammi continue to be highlights, with their sarcasm, and growing father-daughter dynamic. Nova and his allies are completely surrounded and overwhelmed. Wave after wave of warriors and bugs arrive to join the fight against the heroes. The entire planet is lost. Praxagora moves the body of the Super-Skrull to safety. Nova orders Phyla and Peter to evacuate. In orbit, an impatient Annihilus destroys the front wave of his fleet, as a warning to the rest that excuses will not be tolerated. He meets with Thanos to see if the Mad Titan has discovered the secret to the biological application of cosmic power. What Thanos has discovered, is that cosmic energy doesn’t bond to the biology, but to the life force of the recipient. 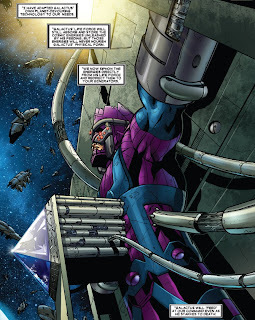 Thanos has adapted Galactus’ own planet-devouring technology to their needs. 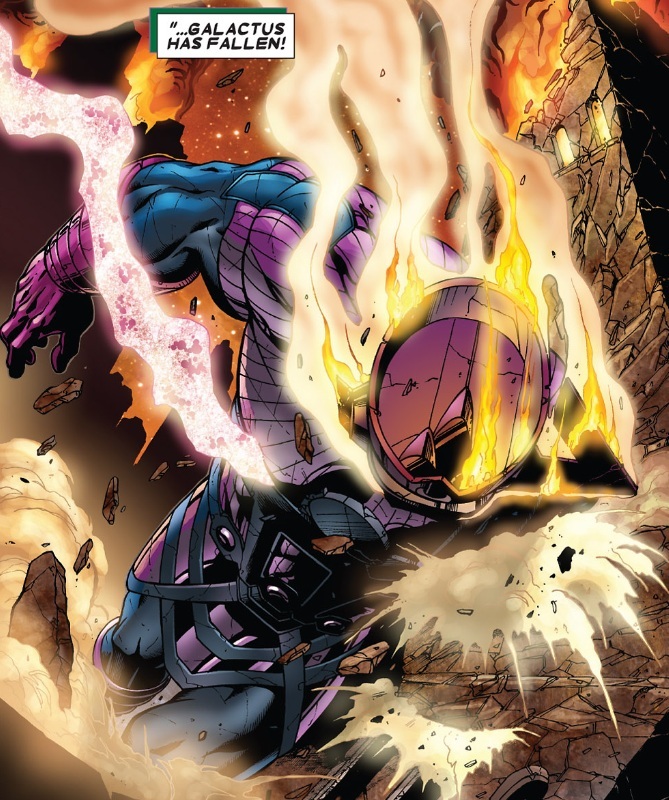 Galactus will feed as normal, but instead of the energy nourishing his physical form, it will be redirected to their generators. The fight between Ravenous and Ronan spills inside, where a briefly revived Firelord joins the battle. Nova concedes that the situation is hopeless, and agrees to order a complete withdrawal from the planet. And Gamora has the mind-controlled Terrax defeated, but is swooped away by Stardust before she can deliver the killing blow. As the team boards the starship to escape, Drax stays behind to delay the advancing forces. Despite Cammi’s protests, they take off, leaving him behind. Nova admits defeat. They have lost the war. The Kree won’t help. For every one person that escaped the planet, another twelve did not. The heralds have disappeared. 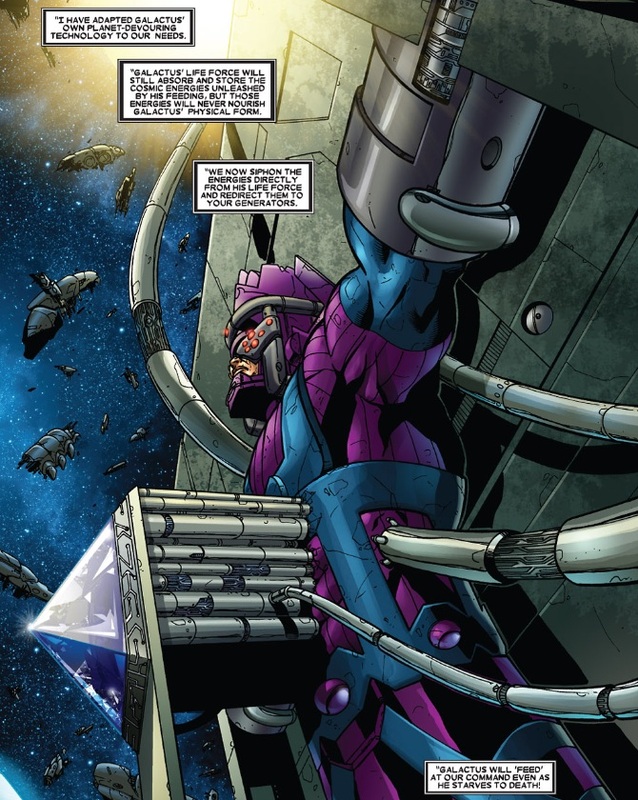 The Wave has perfected large scale teleportation technology, and turned Galactus into a weapon. The United Front rendezvous within hailing distance of Nova’s home planet of Earth. 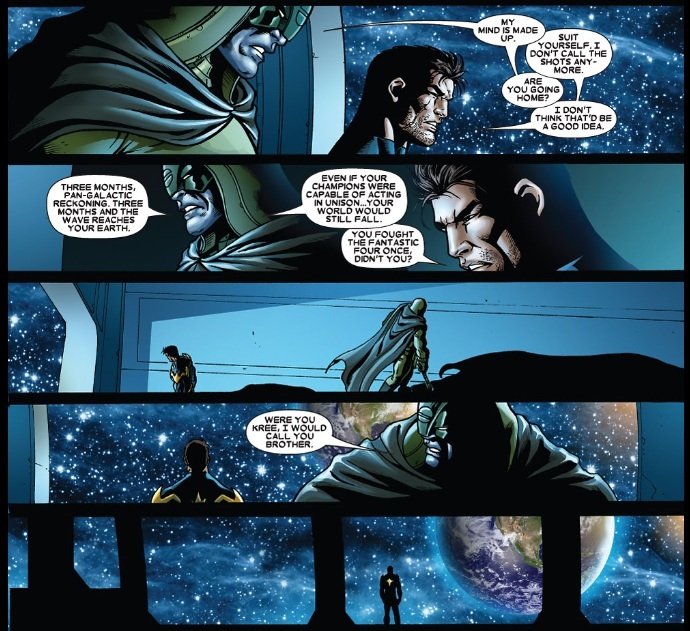 Peter advises Nova that Ronan has requested to leave and take down House Fiyero, with Praxagora and the Super-Skrull volunteering their assistance. 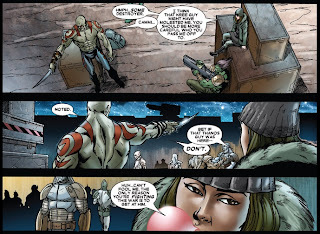 The war all but over, Gamora cut loose the remaining soldiers they had, leaving Nova and his small crew with guerilla tactics as their only option. Ronan and Nova look out upon the Earth. Ronan estimates about three months time before the invasion forces reach Earth. As he leaves upon his self-appointed mission, Ronan says one last goodbye to Richard Rider. Ronan boards his ship, with Praxagora and the Super-Skrull in tow. 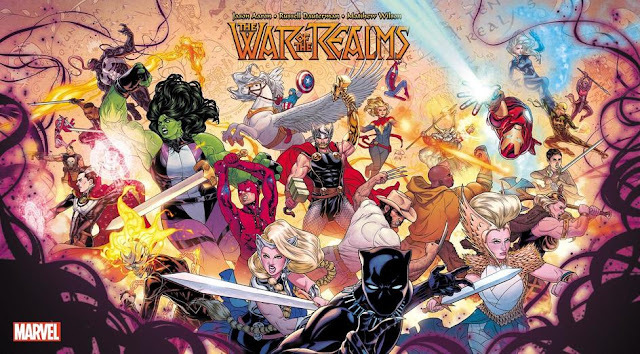 My final brain thoughts: Weaponized Galactus, Firelord unconscious, a hardened Nova, the most dangerous woman in the galaxy, zombie Terrax, the sacrifice of Drax, and a crushing defeat. Will Drax survive to fulfill his ultimate destiny? 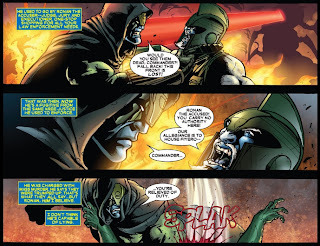 Will we get the Nova versus Annihilus fight we have been waiting for? What will be the fate of Galactus? Join me next time, for the stunning conclusion! This for me has been, hands-down, the best cosmic epic that Marvel has ever done. Keith Giffen really made these B-list characters A-list worthy, giving them all time to shine. Each 22-page issue was fast-paced and packed with story without scrimping on the characterization. And Andrea DiVito really delivered on the art! I'm surprised he's not as popular as he should be. Marvel's upcoming Infinity event has a lot to live up to.